The Indie Ocean, nae includin the Antarctic region. As ane component o the Warld Ocean, the Indian Ocean is delineatit frae the Atlantic Ocean bi the 20° east meridian runnin sooth frae Cape Agulhas, an frae the Paceefic Ocean bi the meridian o 146°55' east. 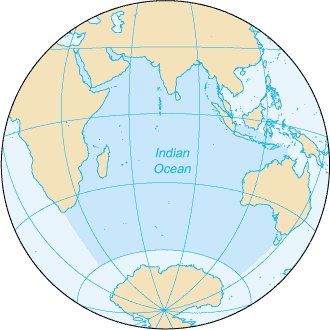 The northrenmaist extent o the Indian Ocean is approximately 30° north in the Persie Gulf. The ocean is nearly 10,000 km (6,200 mi) wide at the soothren tips o Africae an Australie, an its aurie is 73,556,000 km² (28,350,000 mi²), includin the Reid Sea an the Persie Gulf. The ocean's volume is estimatit tae be 292,131,000 km³ (70,086,000 mi³). Smaa islands dot the continental rims. Island naitions within the ocean are Madagascar (the warld's fowert lairgest island), Comoros, Seychelles, Maldives, Mauritius, an Sri Lanka. The archipelago o Indonesie borders the ocean on the east. ↑ Harper, Douglas. "Online Etymology Dictionary". Online Etymology Dictionary. Retrieved 18 January 2011. ↑ Donald W. Gotthold, Julia J. Gotthold (1988). Indian Ocean: Bibliography. Clio Press. ISBN 1-85109-034-7. The Regional Tuna Taggin Project-Indian Ocean wi details o the importance o Tuna in the Indian Ocean.. This page wis last eeditit on 9 Mairch 2018, at 00:25.